The surrounding of the lake is a favorite place for picks you self up. At lake Batur you can see the scenic view and feel cool atmosphere. 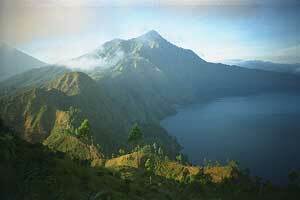 Bangli's mountainous region centers around the spectacular volcanic crater (or caldera) of Batur. Mount Batur itself is actually just a small volcano, but its setting is in the heart of a huge crater. Adjacent to the volcano is the large crescent-shaped Batur Lake, all surrounded by the high walls of the crater rim. As the road rises steadily from Bangli or Tampaksiring, nothing in the surrounding grey landscape of bushes and garden plots suggest the presence of a volcano. But over, one more small ridge a dizzying view awaits the eyes, encompassing the crater and beyond. From Penelokan, the main road runs right round the rim towards Kintamani, the panorama shifting as circling around the crater. The sheer size of the crater conjures up images of the massive eruption of the original Mount Batur that occurred tens of thousands years ago. The volcano is still active today as Balinese still remember the great eruption of 1917. It claimed thousands of lives and destroyed hundreds of temples. Other eruptions have taken place since forcing the local population to be relocated, along with several of their temples, including the main Bali Temple, Pura Ulun Danu. Initially inside the huge crater, this temple has been relocated to the top of the ridge overlooking it. Here it now offers an impressive view of Mount Batur. Located less than an hour from north Bangli. Danau Batur is Bali's largest lake and cribbed with the calderas of an active volcano named Gunung Batur.